Hammams evolved from Roman and Byzantine bathing rituals, and were embraced - and improved upon - by the Ottoman Turks, who relished the concept of deep cleansing and relaxation in a social setting. Today's hammams place an emphasis on luxury, and the Rixos Royal Spa has taken this concept to the next level. Upon entering you could be forgiven for thinking you'd stumbled into a Sultan's private bathroom. The decor is straight out of the Ottoman era, with beautiful mosaic tiles and high ceilings. Once inside, you'll be assigned a personal 'therapist' who will walk you through the process and explain the benefits of the various aspects of the hammam. Heat: the hammam's heat will dilate your blood vessels, improving circulation. Your pores also dilate, allowing for deep cleansing of your skin. Any decongestion will disappear after an hour or so in the hammam. Steam: a steamy hammam promotes cell renewal, as well as clearing up pesky skin conditions like acne and dermatitis. Bath: soothes away those aches and pains. The hotter the better: better blood circulation helps carry oxygen to areas of the body in need of rejuvenation. All these health benefits are good, of course, but for the original hammam-goers they were just a bonus: hammams were a hub of gossip and news; a place to go to find out who's doing what, and with whom. During the Ottoman period the Sultan's harem would meet in the hammam, spending hours gossiping and socialising and escaping from everyday life. Don't expect to see a gaggle of harem beauties at the Rixos hammam, however. If you look closely you may see uniformed therapists going silently and discreetly about their business. They'll be happy to answer any questions you might have - just don't expect them to gossip with you about their celebrity clients. Your first port of call will be the steam room, where your skin will be softened in preparation for the rest of the treatment. Next, you'll be led into a beautiful Ottoman-style room where you will be instructed to lie on the circular marble slab located in the middle of the room. Don't worry - your skin won't touch the cold marble: a fluffy towel will spare you any discomfort. Hot water will be poured over your entire body, and then you'll be scrubbed with a kese: a loofah-like mitt. Next, you'll be soaped all over and massaged by your therapist. Finally, warm water will wash away the soap and leave you feeling wonderfully clean and relaxed. Finally (if your legs haven't turned to jelly) you will be led to a relaxation area where soft music plays while you sip a traditional yogurt drink. 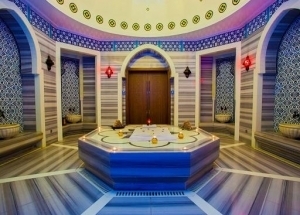 Turkish hammams are famed throughout the world and it's little wonder they're being exported. Rixos' Royal Spa is already proving extremely popular so who knows - before long you may find a Turkish hammam near you.